I eat my peas with honey, I've et them all my life. It makes the peas taste funny, But it keeps them on my knife. 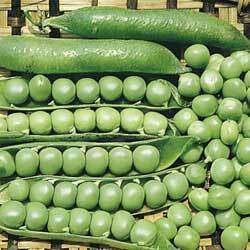 Peas are cool weather and frost-hardy crops that if staked, provide an abundant harvest in a small amount of space. With their graceful vines and attractive flowers, they also make an attractive addition to the vegetable garden. Garden peas (or English peas) have tough pods and have to be shelled. Snow or Sugar peas can be eaten pods and all, and should be picked before the peas develop inside the pods and used in stir-fry type dishes. Snap peas, like snow peas, have low-fiber pods and are snapped and eaten with the immature peas inside. Lastly, Cowpeas (black-eyed peas) are shelling peas that prefer warmer weather. All peas, like corn, lose their sugars rapidly when picked, so cook as soon as possible for the best flavor. For all but Cowpeas, start seeds as early in spring as the ground can be worked. As soon as the first seeds are up, provide any necessary staking, as Peas are rapid growers. Sow more seeds every week to prolong the harvest. Peas are heavy feeders that appreciate side-dressings of manure or fertilizer, but be careful of adding too much or you will have all leaves and no peas. Peas appreciate a mulch to keep moisture in and weeds down. Once in the ground, they do not require much maintenance, except for a daily checking to harvest any pods that have matured. The edible-podded peas should be harvested before the seeds inside are noticeable for best flavor. Peas that vine provide a long harvest as long as mature pods are taken from the vine promptly. Failure to remove mature pods will cause the plant to stop producing. Dwarf-type peas tend to produce pods all at once, which is good for freezing, but will not provide a crop for everyday use. However, these dwarf types are excellent for small-space gardening and containers. Cowpeas are warm weather crops, and should be planted as you would plant beans. Medicinal Properties: Green or English peas contain insoluble fiber, which may be of benefit in reducing the risk of heart disease and stroke. Snap or sugar peas are considered to be of benefit to the immune system, due to their levels of iron and vitamin C.